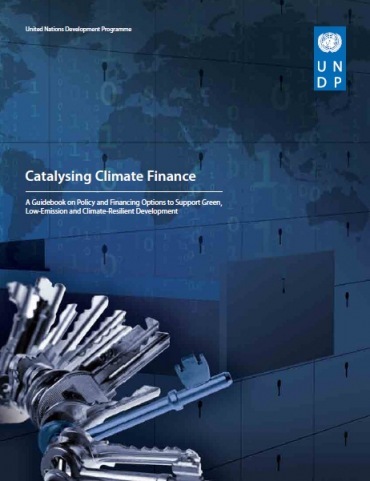 United Nations Development Programme (UNDP) has published a guide Catalyzing Climate Finance. The authors of the publication say that preventing climate change and adaptation to it are fully compatible with the objectives of economic development. According to Pradeep Kurukulasuri, Senior Advisor to UNDP on global issues of climate change adaptation, "the publication represented a watershed for global climate policy when the world created new sources of public funding, such as the Green Climate Fund. From 2009 to 2010, investment in the sector of clean energy worldwide rose 30 percent to reach 243 billion dollars. Only one-tenth of these investments was directed to the economies of developing countries that could benefit from "green" low-carbon growth ..."
The amount of financial assets in the global capital markets is estimated at US$ 178 trillion (McKinsey & Company, 2009), so that, according to experts, there is the necessary size and margin in order to answer the new investment challenge, which is climate change. The main problem in financing the transition to low-carbon society is not capital generation, but in redirecting existing and planned capital flows from traditional high-carbon to low-emission, climate-resilient investments. In recent years, the international community has developed a number of regulatory and market-based instruments to shift investments from fossil fuels to more climate-friendly alternatives. As a result, investments in the sustainable energy market have grown from $22 billion in 2002 to $175-200 billion in 2010 (UNEP, 2010); they could reach $400-500 billion by 2020. Can the world meet such a challenge? Reducing global GHG emissions by 50% by 2050 would require revolutionary changes both in production and consumption in all economic sectors. Such a transformation is possible only when transferring the main stream of public and private investments from traditional energy sources and technologies to low-carbon and climate-sustainable alternatives. According to the International Energy Agency (IEA), the amount of investment needed to meet the projected global demand for electricity in the absence of any carbon restrictions will average 1.1 trillion dollars per year till 2030. Approximately half of this amount will be sent to developing countries, while the funds will be distributed roughly equally among the key emerging economies (China, India, Brazil and others), on the one hand, and all other developing countries, on the other. To avoid concentration of GHGs in the atmosphere above the level of 450 ppm with 50% probability, the global energy investment should increase by 10.5 trillion US$ in 2010-2030 (510 billion dollars per year over the next 20 years) as compared with the baseline scenario of fossil fuels use (IEA, 2009). According to the IEA (IEA, 2009), additional investments are often perceived as additional costs, and climate policy - as an extra burden on the budget. However, the bulk of these additional investments can bring tangible economic benefits. "According to the IEA, the financing of low carbon technologies and measures in the transport sector, industry or buildings can reduce costs by more than US$ 8.6 trillion on a global scale for the period 2010-2030, and US$ 17.1 trillion for the entire investment cycle. In comparison with the inertial scenario, such investments are also able to save up to US$ 100 billion by 2030 by reducing the costs associated with the control of air pollution - the authors of the publication conclude. – However, the initial investment in green energy projects may seem unfeasible. Due to specific difficulties, governmental support measures are required, as usual, even where it comes to highly profitable steps towards low-carbon and climate-sustainable development."